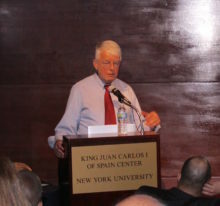 On September 14th, the Jordan Center for the Advanced Study of Russia at NYU opened the fall semester with the 2017 Annual Distinguished lecture on “Russia and the Ukraine Crisis” by Professor Timothy J. Colton of Harvard University, the long time Director of Harvard’s Davis Center for Russian and Eurasian Studies. Colton was introduced by Jordan Center Director Joshua A. Tucker as a “scholar of particular importance to the field”, who in addition to his voluminous research contributions has “trained an entire generation of Russia and post-communist scholars”, and the author of Moscow: Governing the Social Metropolis (1995), Yeltsin: A Life (2008), and, most pertinent to the lecture, Everyone Loses: The Ukraine Crisis and the Ruinous Contest for Post-Soviet Eurasia (2017). Colton defined the main topic of his lecture as the consequences of the Ukraine crisis for Russia, but noted that it’s “hard to separate consequences from the causes […], proximate causes from the remote causes that influence the proximate causes themselves”s. He then attempted to answer the question of whether the Ukraine conflict was a calculated action. He argued, referencing Mikhail Zigar’s book All the Kremlin’s Men: Inside the Court of Vladimir Putin, that the annexation of Crimea was spontaneous and opportunistic, rather than carefully planned, and took by surprise even the highest ranks of the Russian leadership (even Putin himself). The most direct consequence of the crisis, according to Colton, was another “frozen conflict” in the region, which, as defined by the speaker, is “unstable local equilibria that could erupt into a hot conflict”. Although Russia already had a history of intervening into such conflicts in the Southern Caucasus, Transnistria and Moldova, adding Crimea, Donetsk and Lugansk to the conflict map was different in its consequences. As a result, Russia provoked the most “draconian sanctions laid upon a powerful nation since 1940 when the US laid sanctions on the imperial Japan”. Considering the conflict’s destructive consequences, Colton suggested we analyze Russia’s motivation. He proposed that the main drivers of the conflict be examined in two dimensions: geopolitical and identity. From the geopolitical standpoint, Crimea has an advantageous location on the shores of the Black Sea, providing Russia access to the Mediterranean, as well as a long-awaited opportunity to update its fleet. Indeed, from 2008 to 2014, Russia regained control of the Kerch Strait, and its de-facto share in the Black Sea shoreline increased from 260 to 860 miles at the expense of Georgia and Ukraine. Crimea’s importance for Russia from the identity standpoint, according to Colton, comes down to the general population’s nostalgic sentiment over Crimea’s extensive beaches and resorts, and Khersones, an ancient Greek town where the baptism of the Medieval kingdom of Kievan Rus’ first took place in the 10th century AD. Colton asserted that Putin was well aware of Crimea’s significance for the Russian identity, as in the immediate aftermath of the conflict he visited Sevastopol and Khersones church, and spoke at the Nashi franchise youth forum as it moved to Crimea. Further isolating the distinct features of the Ukraine conflict, Colton brought a concept of “nonlinear” or “hybrid” war into the discussion. As laid out by the Chief of Staff Gerasimov in 2013, “in the twenty-first century we can trace a tendency toward wiping out the distinction between the circumstances of war and of peace. Wars are no longer declared and […] do not follow the pattern we are accustomed to”. An important distinction of hybrid wars is therefore that they are not just fought by the military, but involve at large information wars, special operations and peacekeeping. The annexation of Crimea follows the general “non-linear” war pattern with minimum casualties, while Donbass shows a “different physical and human scene” with an official death toll of ten thousand people and millions displaced, according to Colton. Colton noted how the Soviet Union’s iron, steel and coal center, or “the Soviet rust belt”, as referred to by the lecturer, became part of a vision of some actors to reestablish the former imperial region of Novorossia as an independent republic by seizing more Ukrainian territories, possibly even up to Moldova. Putin never openly supported this ambition, although at times he spoke of it in “favorable terms”. Colton also highlighted other consequences of the conflict, which included a strengthening of the “siloviki” (security forces) position with the Russian government, a rise in nationalism and identity politics, and the appearance of a new type of public figures such as the chief procurator of Crimea Natalia Poklonskaya – an avid Russian nationalist and monarchist. With regards to identity, the Ukraine crisis bred all-time high ratings of approval for Vladimir Putin and strengthened the Russians’ confidence in the general direction their country was moving.